Peter Robinson Ltd costume REGENT ST.W. Red wool base with polychrome floral embroidery; silk taffeta rosette; metal buckle. 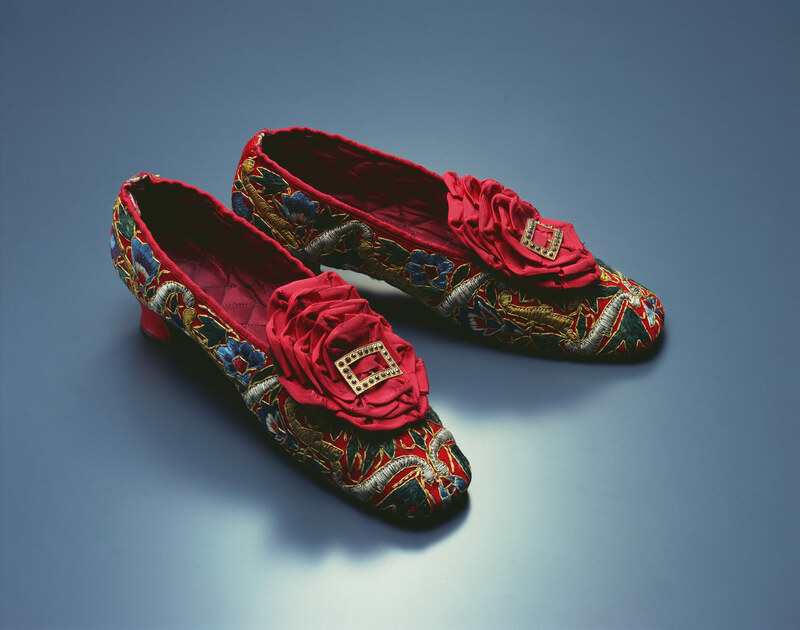 These women's shoes were fabricated in England, using embroidered cloth imported from central Asia. The design vividly tells of the appreciation of textiles and embroidered goods from the East that occurred in Europe during the middle of the 19th century. The technique of applying designs of flowers and grasses by using a plenitude of differently colored threads is called "Bokhara embroidery". It originated in Uzbekistan's Bokhara (Bukhara). The outlines of the motif were first created with single-color thread only, and the shapes were then covered and filled with silver and colored thread. While the designs itself show strong influence of Persian textiles, the abundant use of silver thread is a characteristic of the region of Bokhara.